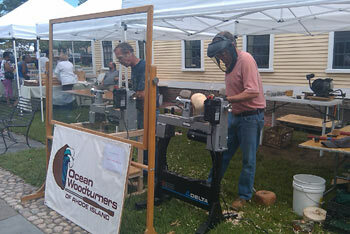 The Ocean Woodturners is the Rhode Island chapter of the American Association of Woodturners (AAW) formed in the spring of 1996. Our purpose is to foster a wider understanding and appreciation of woodturning in Rhode Island plus nearby Connecticut and Massachusetts. You are invited to become a member, or to visit one of our meetings to get a taste of what woodturning in our area is all about! We meet the third Thursday of the month at 7:00PM. We are currently in the process of establishing a new and permanent meeting place so please check for updates on the main page. At each meeting, there is a short business session, a demonstration and show & tell session featuring projects that members have done. Each meeting is filled with an exchange of ideas and useful information. Currently (4/2019) membership is 104 woodturners of all levels of expertise including some who have never turned wood in their lives. Click here to see our Become a Member page. Ocean Woodturners was formed in the spring of 1996 by Ken D’Ambrosio of North Kingstown, Rudi Hempe of Narragansett and Bruce Arnold of Jamestown. Ken actually came up with the idea for a club after seeing a woodturning exhibit in Connecticut put on by a turners club. Impressed by what he saw, he had a hunch that there would be many in Rhode Island interested in membership in a similar club. His friend Bruce also thought it was a good idea. Rudi got involved somewhat by accident. He saw a used lathe for sale in a classified ad –a lathe that Ken was selling. He called to inquire about the lathe. The two got talking about the club idea and Rudi offered to put out newspaper publicity about forming a club. Flyers were also placed in strategic spots such as the Woodworkers Warehouse stores in Woonsocket and Warwick. Ken offered his woodworking shop as a meeting place. The publicity worked and soon the club was holding monthly meetings in Ken’s Saunderstown woodshop on the shore of Narragansett Bay. Initial membership was about a dozen and gradually grew by word of mouth. The members decided they wanted to keep the club simple. The $10 dues would be used to pay for a monthly newsletter prepared by Rudi. The members decided against having bylaws but they did elect Ken as president; Bruce Arnold as vice president and Rudi as secretary/treasurer. The members said they were interested in woodturning first and foremost and did not wish to create a club with a lot of formality. In the second year, the club started meeting every month (the first year, the club did not meet in the summer). And the club became a chapter of the American Association of Woodturners. Each meeting had a program and show and tell segments. During the third year year, Ken offered his beautiful bayside home as site for a club outing. This outing has become a tradition. Another tradition is for club members to make ornaments for donation to the Hasbro Children’s Hospital. After three years the club grew too big to be comfortably accommodated in Ken’s woodshop. Rudi found another location, Black Mountain Woodworks owned by woodworker Jaime Stevens, in the historic Shady Lea Mill in North Kingstown. It soon became apparent that the club needed its own lathe. An approach was made to Bill Barske, owner of Quaker Lane Tool Co., who gave the club a new Jet lathe for $100. In return, club members put on demonstrations at Quaker Lane’s annual 2-day sale. The year 2000 was significant for the club because the AAW decided that its 2002 symposium would be held in the Providence Convention Center. That will make Ocean Woodturners the host club. At the end of the year, several club members made turnings to be donated as a fundraiser for the University of Rhode Island Master Gardeners Association. After a year and a half meeting at Black Mountain, the club had to find new quarters because Jaime Stevens was going out of business. Member Ray Hall offered an outbuilding on his property in Peace Dale. Club members volunteered labor to fix up the building. We met at Ray Hall's for a few months and then relocated to the Cold Spring Community Center in North Kingstown when our membership became too large for the building. 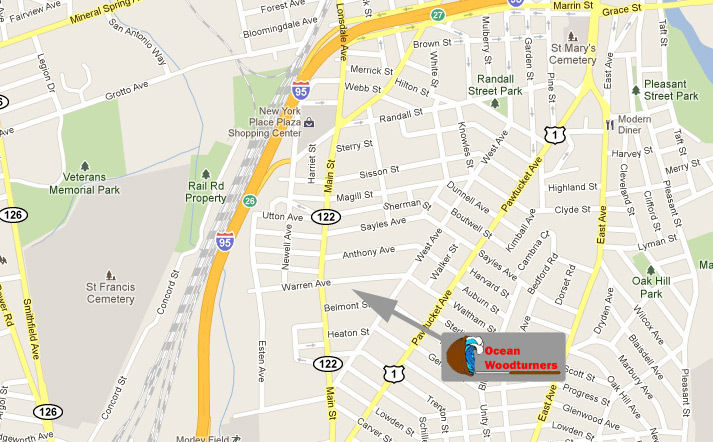 In May 2002 we moved to the Woodcraft store on Division Street in East Greenwich.